A group of MA students studying at the The Academy of Visual Arts at the Hong Kong Baptist University met up on June 30, 2013, to discuss their at the time recent visit to the exhibition I Think It Rains. Upon their own initiative they gathered to have an informal discussion about the curatorial format, questioning the weight of a “coherent” motif in exhibition-making, or pondering about art inspired by experiences induced by drugs. The conversation was not commissioned, and the opinions expressed do not necessarily reflect those of the Burger Collection. The following selection of the transcript follows Burger Collection’s wish to support informal levels of exchanges. The discussion was originally held in Cantonese. The Chinese version can be read right below the English one. English translation by Daniel Ho. Edited and proofread by Linda Jensen. Transcription by Dino Wong. Edited and proofread by Xue Tan. Additional thanks goes to Choi Yan Chi. T: This exhibition is entitled I Think It Rains. What’s the relationship between the theme and the works themselves? I’m thinking about whether we can find some commonalities among all the works. D: The phrase I Think It Rains sounds light and simple, and suggests this in-between state of trace and disappearance. In my way of looking at it, the resonances between the works and the theme aren’t that obvious. Perhaps it’s because the thirty-three works weren’t all made for the exhibition. T: Are these works actually all from the Burger Collection? Did the curator select some works from the collection? D: I think it’s partly the result of negotiations between the curator and the collector. It’s said that some of the works were made for the exhibition [Burger Collection commissioned artists from Hong Kong and artists in the residency program]. P: What deeper significance does the title I Think It Rains actually have? D: It’s apparently a poem by a Nigerian poet. In it, “rain” refers to how the village was burnt down to ashes, which was scattered everywhere. I haven’t looked into the exact reasons. T: Perhaps this can be understood in the sense that the works in the exhibition are relatively conceptual and a bit elusive—like Lam Tung Pang’s work [Ghost – Disappeared Hong Kong Art (1): 90s, Kurt Chan, 2013] which isn’t visible. P: I’m of the opinion that when curating an exhibition, if you expect the works to be tightly woven in with the theme, then the theme itself must be fairly concrete. It could be about an event, a place, a group of people—and then from these starting points, you make the work. I’m reminded of an exhibition called Our life in West Kowloon which took place on the rooftops of a Chinese tenement building (Tong Lau) in Sham Shui Po. There was a photo show, an art exhibition, a group of art guides organised by the residents, as well as a book. That’s an example where works really resonated with the theme and title—everything followed on from it. Turning back to this exhibition, the participating artists were all quite well known, so perhaps they were more loyal to themselves rather than to the theme. S: I Think It Rains itself is a line of verse, and poetry often has a lot of room for interpretation. D: The works exhibited have mostly been selected from the Burger Collection, so sorting out the context became, to a large degree, the work of the curator. P: Summing up the works—they all seem to be about what has vanished. Lam Tung Pang’s work, the video by the Portuguese artist Filipa César, Choi Yan Chi’s workA Desk to a Forever Reader, as well as Kingsley Ng’s workMoon . Gate all lie at the cusp of what has disappeared and what hasn’t yet disappeared. Is this theme about “rain” some sort of echo to this? D: An abstract, blank imagery on top of another abstract, blank imagery—interpreting it this way certainly works. The key is whether it’s meaningful and whether it adds to the power of the works. In actual fact, is it that hard to demand that an art exhibition set a theme, and ensure that the works resonate with the theme? S: It is hard—as long as the exhibition involve more than one participant. If it’s a solo show, then it will work no matter what, because it’s self-explanatory. What the works in the exhibition present are the threads about the personal self, even if it’s something of a messy and mistaken logic. The theme presents the artists themselves. T: If works were created collaboratively according to a theme, then it might work. S: Not necessarily. For instance, in some exhibitions with two artists, when they attempt to respond to a same theme, they will often find that while creating the works, their understanding is very different, and not infrequently, this leads to a sense of imbalance. P: That situation is like in Melting Pot during [the exhibition] Painting On and On. The dialogue between the artists was also the starting point for some of the works, but the presentation ended up being neither here nor there. D: Let me bring the topic of the conversation back to the discussion about themes. Do we all think that an art exhibition should first have a theme and then the works come after, or rather the works first and then the theme? S: Well, that depends on whether it’s a solo or a group show, as well as on the curatorial approach. Additionally, even if you know the theme prior to creating the works, the artists might, because of their own creative bent, make the works fit the theme rather awkwardly. D: I, on the other hand, think artists have already made the grade if they’ve gotten to that point. The works themselves are the artists’ responses to a certain topic, which may have extended or come about from the theme of the exhibition. As for whether they fit well or not, or what the connections are between all the works, that is the work of the curator—how to understand the works, how to create a context for the exhibition, who the target audience is, and other such questions. P: I agree. When artists are working and struggling hard with making works, the role of the curator is to organize them. For instance, if the curator sees “life” as the central core of the works, then he/she will use “life” as the connecting thread with which to curate the exhibition. D: Right. Pushing this further, if setting a particular subject is effective for an exhibition, then the aim is to establish a certain context for the audience to understand the exhibition from a particular angle. If a theme can accomplish this point, then it works as a suitable theme. In contrast, empty, elusive themes don’t help the audience understand the exhibition or the works, in which case it doesn’t actually make a difference whether the theme exists or not. D: Now let’s explore some of the works and their content. What kind of opinions or reflections do you have about the works in this exhibition? I quite like Enoch Cheung’s work; it approaches the form of a performance. Before producing the work, he drank a large amount of condensed coffee. Then, under an extremely stimulated mental state, he painted on the walls of the exhibition space with the coffee, night and day. Some are realistic drawings, like architectural buildings, while others were more abstract, resembling the writing of some symbolic script. P: Condensed coffee didn’t seem to have had much of a strong effect. Wouldn’t smoking pot have worked better? P: Actually, back in the time of surrealism, artists like Dali tried to shoot up drugs to force themselves into a peculiar mental state—and then they would try to create art. T: Absinthe seems to have been popular for a while. S: Absinthe used to be banned, but now it’s legal again. Drinking it makes you hallucinate. P: Back in the day, many artists would use pretty extreme methods to force themselves into a subconscious state, and then start drawing. Enoch Cheung’s condensed coffee is relatively mild in comparison. D: The question is how alert and conscious did the artist want to stay? P: But this can’t really be calculated clearly. D: There’s always a difference between how strong and weak something is. For instance, I can’t accurately say whether my mental state after smoking pot is in fact equal to my subconscious. P: Apparently artists back then wanted to pursue this half-awake, half-dreamy state. I think everyone’s had a similar experience—when you’re half-awake, some dreamy, hallucinatory images would appear in the mind, and ten minutes would feel like two hours. T: For me, I think Enoch Cheung made the piece with a more contemporary approach in mind. He purposely chose condensed coffee maybe to hint at the pressures of modern society—when we frequently need to rely on stimulating drinks to give ourselves the stamina to face the pressures of life. This approach might be like those artists back then, and yet the content and direction expressed are something else altogether. D: The important thing is to let the audience see the constant states of flow and change within the work. His drawings have such diverse content: some are realistic views of surroundings, while others are fluid strokes of writing, and still others are abstract to the point of continuing the already existing traces of water and the cracks on the walls. The process of crossing over from one part to another is pretty interesting. D: Both being works where sound is an important element, if you compare the works by Lam Tung Pang and Kingsley Ng, Lam Tung Pang’s work is clearly narrative–a descriptive narration. The soundtrack in Lam Tung Pang’s work deliberately avoids subjective adjectives, and yet this doesn’t hinder us from understanding and constructing the content of the narrative: an installation by Kurt Chan. And the funny thing about this approach lies in how the audience, through reading the narrative, imagines in their minds that particular work, which doesn’t exist anymore. So everyone has a different “work” in mind, which contrasts with the objectivity intentionally concocted in the soundtrack. P: I always feel that creating sound is different from other media. Making a sound piece has to take the surroundings into consideration. D: Right. 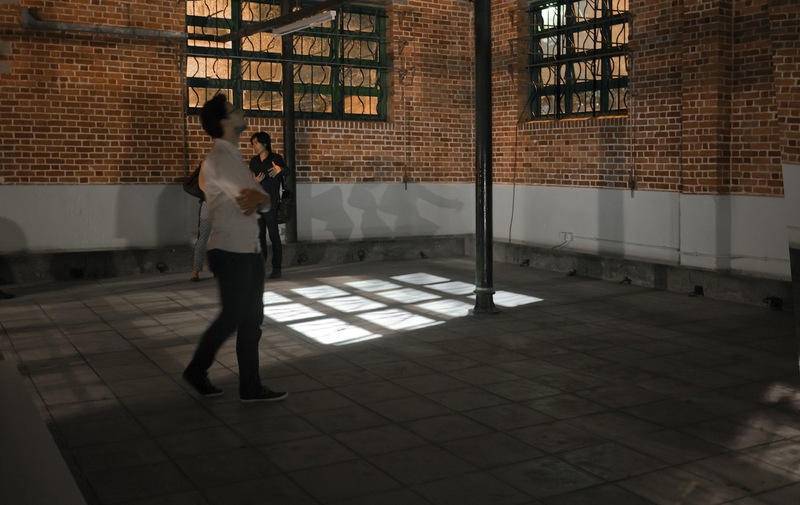 Taking Kingsley Ng’s work as an example, the sound part is treated more like ambient sound, and the loudspeakers are also deliberately concealed. When reading this work within the exhibition space, the sounds from the site itself (the sounds of wind, rain, people, and other works) easily get mixed up with the sound of the work itself. What’s interesting is that, because the work is presented differently depending on time and space, it also becomes ambiguous. T: I feel the work with the pickaxe and shovel [tools for the real-time activity Wendigo River / The Crystal Source / Kowloon, 2013]is actually pretty interesting. But forbidding the audience from direct contact with the work seems to have drastically reduced its impact. S: I accidentally stepped on the work. D: Which is really not bad at all as far as accidental mistakes go. S: The aim of the work is to record and re-perform the sound of implements—like the pickaxe—digging at the ground by placing a recording device on the tool itself. If the audience could be allowed to get their hands on these tools themselves, to create the sounds by knocking them against the ground, then it’s even more direct and fun than stomping on the floor around them. And the recording device isn’t of high quality, so it can’t amplify the muffled footsteps recorded around it. D: If the audience can only get involved with their feet, then how should they take part, in terms of their role and circumstance? S: Placing the recording device on the tools which must then be handled doesn’t seem to be the best expressive approach, does it? T: Perhaps the artist could record different segments of digging sounds with this installation in order to replay them as recordings, instead of directly placing the works within the site. D: When we picked up the pickaxe—which was against the rules—I felt its actual weight. That’s my initial experience, which was a pretty fun. Or perhaps it’s some transgressive, rebellious psychology. S: The way the work is displayed gives me something of an unfinished feeling—like the amplifiers laid out on the side, connected to two microphones in the shape of pickaxes, forbidden to be touched—this doesn’t really take the relationship between the space and the work into consideration. What’s more, it doesn’t let you connect with the creative ideas behind the work (the artist having dug up different types of dirt). T: Right, like what kind of soil, what significance the digging place had, and so forth—it doesn’t let people know about that. S: It’s as though two sound installations were made and then carelessly placed within the space. T: Well, if that’s the case, they didn’t have to be pickaxes. They could have been anything. P: Song Dong apparently made a similar work: he held a seal, and then forcefully and repeatedly struck it against the water surface. A seal pressed on paper would leave an imprint, but struck on water, it’s like water off a duck’s back. Session 1: The Possibility of New Media and Poetic Dialogue with the Environment? Artist Sharing was a series of discussions held during I Think It Rains, the exhibition by the Burger Collection and 1a space. Artists and cultural producers involved in the exhibition were invited to discuss their practice, their artistic methodologies and their intentions. Artist Sharing was a series of discussions held during I Think It Rains, the exhibition by the Burger Collection and 1a space. Artists and cultural producers involved in the exhibition were invited to discuss their practice, their artistic methodologies and their intentions. Participants and artists included Kingsley Ng , Enoch Cheung, Yiufai Chow, Choi Yan-chi, Lau Ching Ping, Ng Kachun, Reds Cheung, Annie Wan, Lam Tung Pang, Cally Yu, Lai Tszyuen and Evelyn Char. 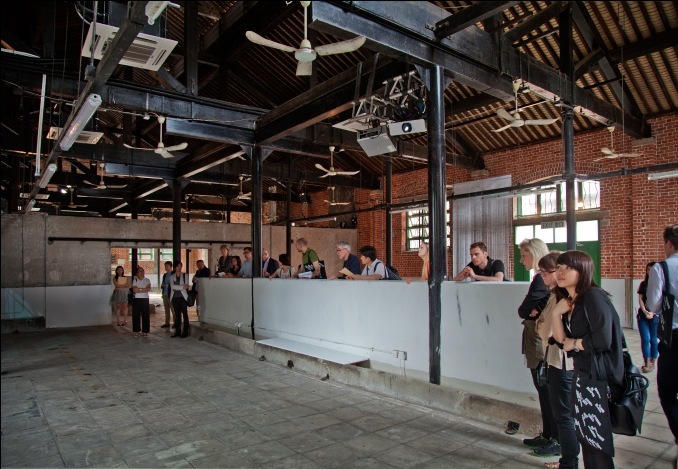 The discussions, in Cantonese, were held on June 20, June 27 and July 5, 2013, at 1a space at the Cattle Depot Artist Village, To Kwa Wan, Hong Kong. Photos by Anki Lau and Joyce Wong.